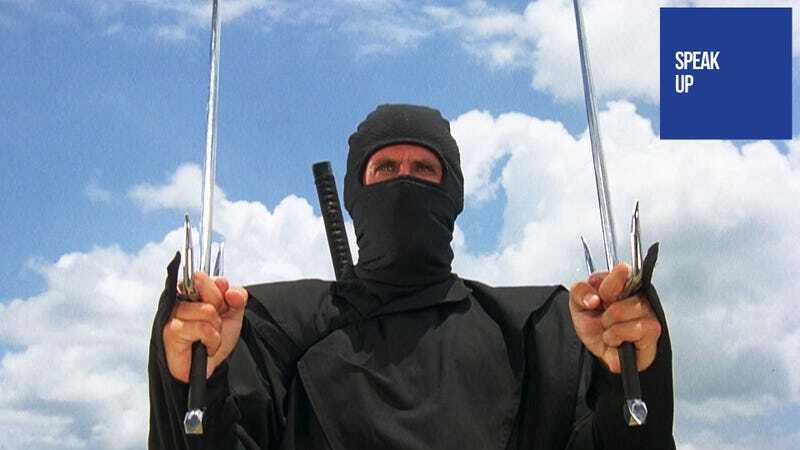 Commenter Kevwood112 worries that we as a community may have lost sight of what it means to be a ninja, which should be a good thing, as you aren't supposed to see them anyway. Let's Speak Up about it. My friend and I were have a discussion the other day about ninjas and how they are portrayed now, particularly in video games, anime, and manga. I made an observation on whether or not the true meaning of being a ninja has been lost nowadays. Now, I enjoy playing games like Ninja Gaiden, Shinobi, and the Naruto Ultimate Ninja Storm games, but sometimes I can't help but say that these guys aren't truly ninja. As I'm sure most of you know, being a ninja was about being stealthy and leaving little to no trace of who was responsible for the kill. In terms of gameplay, I can understand the need to add a bit of flair and action to true but somewhat dull ninja combat (with the exception of the Tenchu series I suppose, but I've never played the games so...). I guess what I'm trying to say is that while it's fun to rampage through hundreds of ninja, leaving body parts all over the place or launching a giant fireball while announcing the name of jutsu, I hope that the true meaning of being a ninja is not lost nowadays, especially with the younger generation of gamers.